Scrooges victim lies motionless with a knife in his back. There arent any witnesses… or are there? Travel back and forward in time to get help from the Ghosts of Christmas Past, Present and Future in this Hidden Object Puzzle Adventure game. Can you uncover the dark side of Charles Dickens famous Christmas Carol story? 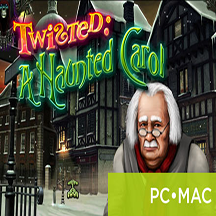 Help Marley get revenge on the old miser and murderer, Scrooge inTwisted: A Haunted Carol!